This is our Double Lane Big Kahuna Water Slide. 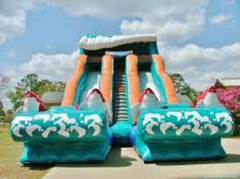 This is just as cool as our standard Big Kahuna Water Slide but it has two lanes for sliding. Very tall, very fast and tons of fun!! !